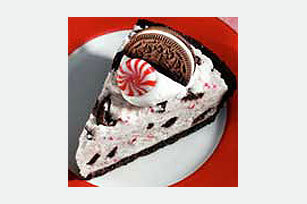 This easy pie has it all—creamy frozen yogurt, crushed peppermint candies and chopped chocolate sandwich cookies—in a chocolate cookie crumb crust. Reserve 8 mints and 4 cookies for garnish; set aside. Crush remaining mints and coarsely chop remaining cookies. Place chopped mints in large bowl. Add yogurt; mix well. Gently stir in chopped cookies; spread into crust. Freeze 4 hours or until firm. Let stand 10 min. before serving. Cut reserved cookies in half. Top each serving with 2 Tbsp. COOL WHIP, 1 cookie half and 1 mint just before serving. Prepare using your favorite flavor of frozen yogurt.